When these Cranberry Five-Spice Cookies were being floated around in the month’s nominations, I didn’t realize that they are in the “cocktail cookies” section of the book. This is the section where the cookies lean more savory than sweet…nibbles to go with a glass of wine or an aperitif. 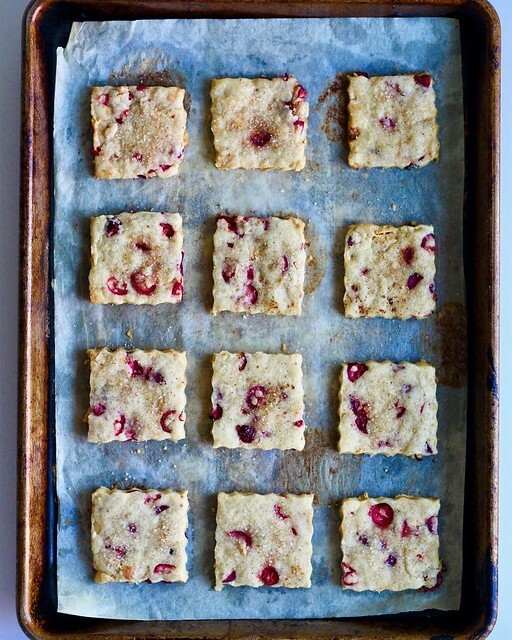 These ones have the texture of sugar cookies, but they are only very lightly sweetened, and are flavored with tart fresh cranberries, salty peanuts and Chinese five-spice powder, an exotic mixture of ground cloves, cinnamon, fennel seeds, star anise and Szechuan pepper. A lot of times, I like to cut roll-out cookies like these into squares rather than rounds so I don’t have any waste. I sprinkled these with a little mix of extra sugar, salt and five-spice before baking. Even though they weren’t quite what I had in mind when I cracked open the book to make them, I did like them. I thought a bit of spreadable goat cheese on top went rather nicely. Oh YES – goat cheese on top sounds amazing! And I love your idea of rolling these and cutting them into squares! I might steal it! I love your idea of cutting into squares so you don’t waste any dough. I can’t wait to bake them! Goats cheese on top would have been good. I had not realised these cookies were meant to be savoury and I was confused by them. I didn’t realize these were going to be so savory either. I also didn’t pay attention when voting, ops. Sounds like these were a hit with you. I still have some laying around my house, I think I made too many. These look bloody tasty! Cheers for sharing I’m going to get on making these.